When Google introduced Android 4.2, one of the features that seems to have been overlooked a bit, is DayDream. For those not familiar, think of DayDream as Google’s attempt at a more robust docking station app. If setup properly, you can have your phone or tablet automatically display a clock, secret BeanFlinger screen, Google Currents, or photos upon docking. The clock, for whatever reason, is a bit lacking, though. Enter Clock Plus. 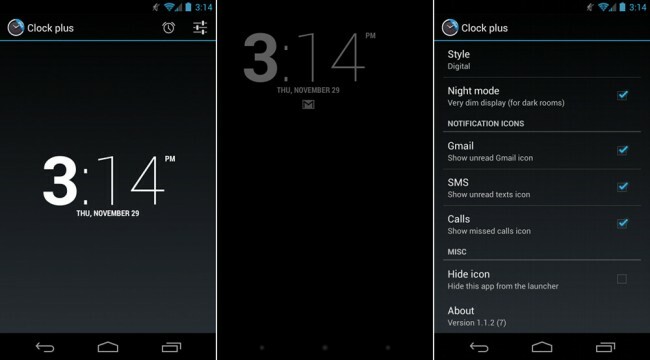 In Clock Plus, a free app on Google Play, you can have the clock display an icon for missed calls, unread texts, new Gmail emails, and your next scheduled alarm. While these are simple additions, they are greatly welcomed. Also, since DayDream is an Android 4.2-only feature, Clock Plus is an option for those not running the newest version of Android. If you are running Android 4.0+, you can install this app and use it as a clock replacement.